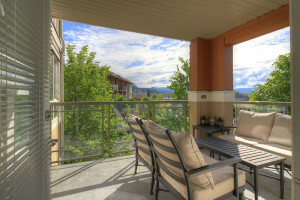 Located in the WATERSCAPES RESORT – SKYE TOWER, this air conditioned suite provides the best in luxury as well as great views of the Okanagan Lake. This 3 Bedrooms (1 is windowless(den)), 2 Bathroom suite is situated on the north westerly side of the Skye Tower this suite benefits from glorious afternoon sun and panoramic views from the near floor to ceiling glass windows and the deck. You can see the working mill in the distance on the right side of the suite and views of the lake as it makes it way past St Paul’s tomb – a local walking destination around Knox Mountain. The Master Bedroom provides a Queen Bed with Ensuite Bathroom, Queen Bed in the second bedroom, 2 Twin Bed (T2K) in the third and a Queen sofa bed in the Living Room. 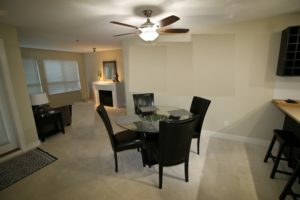 The suite has TV’s in all bedrooms and den along with the living room. Cable service with high speed internet (Wi-Fi). In suite laundry with full size washer & dryer, extra bed linen, towels, pool towels and a gas BBQ on the deck. Within the building parkade you will find a reserved single car space located conveniently close. It is fully equipped with all that’s needed to accommodate up to 7 people (6 if you don’t want to have guests on the living room sofa bed).